As a good friend our mind is indispensable in the life-long task of navigating through the hazardous world dream of life. The mind contains great power of Intellectual Discrimination and Reason. This is a benign adjunct and vital for our Sadhana (spiritual practice) to progress. Bhagavan, terms the mind ‘a wondrous power in the Self , and states that our thoughts issue, from the thought ‘I’, from this source, and that it rises in the Heart . This leads one to the conclusion that our Destiny is largely controlled by the different Thoughts sent to us. In effect we are like puppets on a string, controlled by a benign inner ruler who ultimately predetermines our spiritual development leading us to Self Realisation. Some thoughts we deem to be appropriate and so we act. Some thoughts we reject as inappropriate and unworthy. When we do not react to thoughts but remain in awareness, they lose their hold on us. The mind purified of the identification with the thoughts merges in its Source, in the Heart, and thus the thought free state of the Self is recognized within. It is a Vedantic aphorism that ‘all the buds on the almond tree will eventually open, but some will open sooner and some later’. This is obviously on a very long time scale from our human point of view, based on our ignorance. Through our spiritual practice we eventually become convinced we are not the ‘doers’ of actions’, as we mistakenly believed. The mind as an Enemy, however, is synonymous with the maligned term ‘Ego’ and our main obstacle to Self Realisation. The mind, contains the adjunct of the brain, or organ of cognition, which creates the Maya, or illusion, for the personal dream to happen in. Built into the organ of cognition are the perceptions of space, time and cause and effect which create the stage for the limited sensory apparatus to operate and the personal dream to take place. The mind is also packed full of harmful tendencies, and accumulated useless influences, that obscure the Real Self, and eventually have to be sacrificed in an act of total surrender, to the Real Self in the Heart, for Self Realisation to happen. Then the purified part of the mind will continue as a servant , no longer the tyrannical Master. The entire perspective has changed. A perceptual shift has taken place and the substratum of all that is perceived is known to be Divine and a Unity. As Sri Bhagavan has made plain, through earnest persistent Self Enquiry and Surrender we come to realise as he says “The mind turned inwards is the Self; turned outwards, it becomes the ego and all the world” , and is in fact the Self! This crucial statement highlights the great paradox of the mind. Now let us examine its Nature. Bhagavan often tells us that ‘the mind is only a bundle of thoughts’ . This can be confirmed by self observation when we watch our minds rapidly flitting from one branch of thought to another, leading to what Shankara and other Sages have termed the ‘monkey mind’. This ‘monkey mind’ is governed by the tendency to associate one event with another, through memory and its conditioned response. Self observation shows that the mind consists of umpteen fragmented small I’s, which make up the umbrella term the ‘I Thought’. Each separate ‘I’ has been conditioned to produce a laid down response or role, to be played out in any given situation. There does not appear to be any central entity there, we can term I, but only this large collection of different small I’s, with their own voices. The Real I or Self is heavily veiled by this mind stuff. The root of this psychosis is the identification of the mind with the physical body . This is the Arch Vasana which persistent, earnest, Self Enquiry and Surrender has to remove. The mind creates a mirrorisation which means we are living from a stepped down impure reflected Consciousness, and not the Absolute Pure Consciousness-Awareness of the Jnani or Real Self. We also split our perceptions into an imaginary subject we call ‘me’ and an object out there, instead of seeing a non-dual unity. Under the play of the three Gunas and the Law of Polarities, or play of the opposites, the emotional content of these petty I’s or Thoughts, are continuously changing. more or less out of our control, and somewhat chaotic. The emotional pendulum swings between elation and depression, until we learn some equanimity through our spiritual practice. There are even strong contradictions which are unobserved and break out into expressing our dislike, when we are unaware that we have the same tendency in ourselves, and therefore project it onto others. 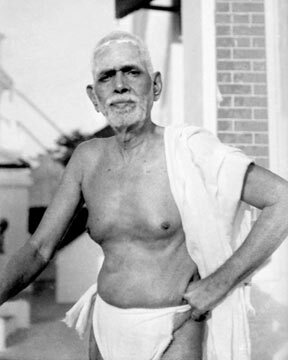 No wonder Bhagavan termed the mind as ‘wandering and perverted’, and the main obstacle to Self Realisation. In Chan Buddhism, the mind is similarly termed ‘the Slayer of the Real’. Bhagavan has also told us that the mind is a tyrant that will never kill itself, and only pretends, like the thief who dresses up as a policeman to catch himself. So the mind is inherently hypocritical. Consequently, through spiritual practice we learn the necessity of mind control if our sadhana is to progress. Bhagavan teaches us that watching the flow of breath quietens and controls the mind. The use of mantra japa also halts the wandering mind in its tracks like the chain around the wild elephant. Self Enquiry brings the errant thought back into its source. Ultimately Grace is needed to destroy the mind. It acts in response to the intelligent part of the mind’s own efforts of Self Enquiry and Surrender. The mind cannot judge its own progress in sadhana, and has to continue relentlessly until Grace delivers the final blow and the mind topples, then to lead us to what is paradoxically called the ‘no mind state’. In the ‘no mind state’ which is living from the Self, and not from the wandering perverted mind, which now has been rendered harmless as Bhagavan says ‘like a burnt out rope’ or ‘the moon in the sky at mid-day’. The Self, we discover, contains great powers of deep silence, unconditional love, clarity, awareness and the Gnosis of Jnana. Such is the glorious gift of this great Teaching which if earnestly practiced will one day, in this or some other lifetime, lead to this promised, blessed blissful state. at Ramanasramam.Hope you remember me,i am Dr.Raju who accomponied Nannagaru. I have looked at your excellent blog. If you send me your e mail address then I can invite you to our Harshasatsang and we could notify members of your blog. It would be great if you joined. I request you to give your personal id. Thank you, Alan, for this lovely post and to Harsha for providing the space. I always enjoy the clarity and inspiration in the writing. Alan-ji has contributed greatly to the Bhagavan devotees through his clear and lucid writings. “As Sri Bhagavan has made plain, through earnest persistent Self Enquiry and Surrender we come to realise as he says “The mind turned inwards is the Self; turned outwards, it becomes the ego and all the world” , and is in fact the Self!” Read on…great post, thank you Alan Jacobs and Harsh Luthar.